Can you believe it? By now hopefully you have FOUR FULL COMPLETED FIRST DRAFTS of your picture books! Time to work on Draft No. 5! Meet GREG NERI! I met Greg at the annual Society of Children Book Writers & Illustrators national summer conference. We’ve kept in touch ever since. I’m a huge fan of his writing. He’s a very versatile writer, having written everything from novels to poetry to filmmaking and screenplays. Although NAPIBOWRIWEE is all about picture books, I felt Greg would be an appropriate author to include for this year’s event because of his book CHESS RUMBLE. 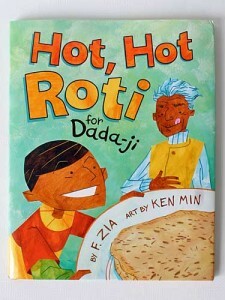 This book is for ages ten and up but it is a unique mix of free verse poetry and illustration. The picture book market has influenced other older genres like middle grade novels, chapter books and YA novels to include more visuals and artwork for our increasingly visual children and teens. “I write books for young people. 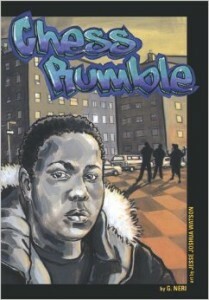 Many of my characters are characters of color who live in urban centers like the Bronx or Philly or Chicago. They speak in urban dialects. They deal with gangs, poverty, gentrification, broken families. But the books are hopeful in their search for belonging, for love, for connections. They are books for humans. 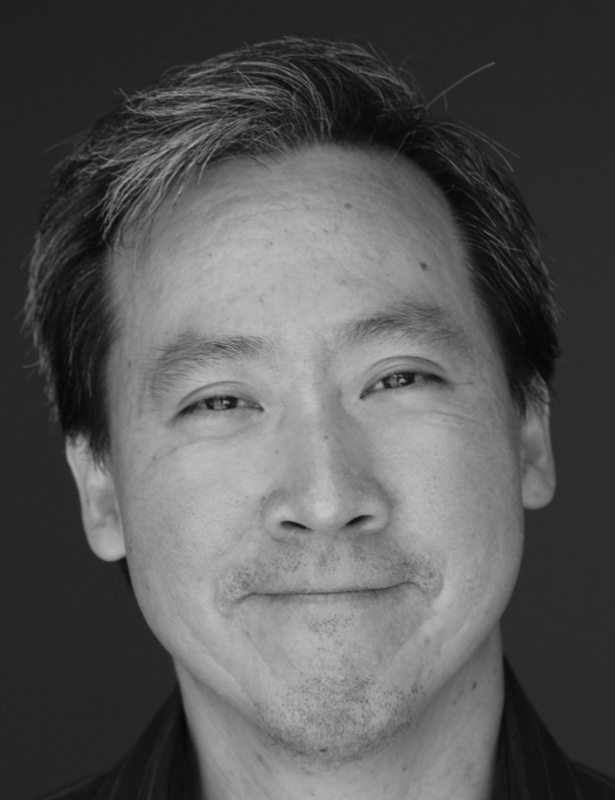 “Many of my readers don’t read because they don’t see people like themselves or hear voices they recognize. Comments I hear over and over: this is my story, this is my world. Why aren’t there other books like this? Where’s your next book? 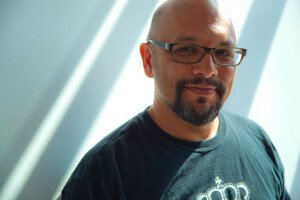 I point them to folks like Walter Dean Myers, Sharon Flake, Matt de la Pena and many others but they usually have read those and the very short list of my contemporaries. When they run out of titles, they read them again. And again. “My books will never be on the NYT Bestseller list and are hard to spot in your neighborhood Barnes and Noble. But they are widely read. I travel the country going to schools where they cannot keep them on the shelves. For every dog eared copy, hundreds of kids read them, passing them along like they can’t believe what they are seeing: themselves. Seeing themselves on a page is like discovering that you are worthy of being written about. That you belong in this world that will write about everything under the sun except you. Bravo to Walter and Christopher Myers for what they do and who they are. There are many more out there like them. PRIZE: Two lucky winners will receive an autographed copy of CATERINA AND THE PERFECT PARTY (Written and illustrated by Erin Eitter Kono, Dial 2013) and HULA LULLABY (Little, Brown 2005). Meet ERIN EITTER KONO! Guess where I met her? Yup! The SCBWI conference. 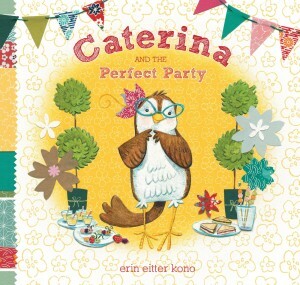 Erin is an award winning picture book author and illustrator. 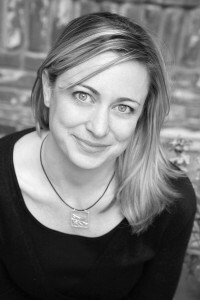 She grew up in the midwest and studied Art History at the University of Iowa and the University of Hull in England. She studied Graphic Design and Writing through UCLA Extension in Westwood, CA. She lives in Palos Verdes, CA with her husband, daughter, dog, hamster, and the neighborhood’s wild Peacock. “As a former airline flight attendant, I’ve been privileged to have traveled extensively throughout my adult life. I believe that the more cultures one encounters the easier it is to respect differences in people and to appreciate how we are all innately the same. A good story is just another way of traveling. 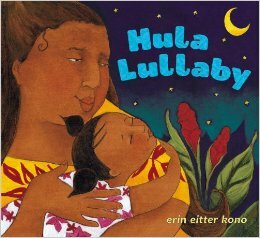 My first book, HULA LULLABY (Little, Brown 2005), told the story of a Hawaiian mother and child. I was inspired by many years of traveling to the islands and by friends in the Hula community. I worked hard to be true to the native culture and consulted with experts in the community. “Books are the most efficient and affective way to create understanding of both ourselves and others. Stories allow us all to experience the world through another’s perspective, whatever their race, whatever their culture. A character’s world comes to life and brings the truth of that existence to the reader no matter who they are. “Multicultural books not only allow children of all backgrounds to see themselves in print, the importance of which can not be over stated, but they also influence the world of everyone who reads them. Diversity as the slogan says, is the one thing we all have in common. I believe whole heartedly that we need to read far more books by writers of all ethnicities. To not have those voices means that we are missing out on learning the nuances of those worlds, of our world. It is shameful, because our country is diverse and will only continue to become more so. We as writers, whatever our backgrounds, should strive to tell more than just the dominant culture’s viewpoint. Grateful thanks to Greg, Ken and Erin for donating books to our prize contest and taking time to answer our questions on diversity! Hang in there, everyone! We’ve still got two more days left! You can do it! Please comment below on how your Day Five went! I have a very very rough (think crocodile skin) day 5 draft in the books. Super post! Paula, I KNEW you’d catch up. You rock! Congrads! Greg, you’re on the kids best seller list and that’s THE list to be on! Ken, it is an awesome responsibility. Erin, it’s all about creating understanding. What great reading today. Thank you for giving us your time. I’m writing mine right now. Non-fiction. My first. So it needs work. Ha. And that’s okay! Yay for your getting caught up, Paula! My draft yesterday is more like a glorified outline, but I’ll take what I can get. LOL! I love the varied experiences and insights Greg, Ken, and Erin bring to the multicultural kids books world! I hope that, one day, all kids will have at least one book where they can identify with the main character and feel included. Day Five draft is SO not pretty but done! It took a bit of effort to get going. Yucky morning. So, I put on a cup of tea and here I am…the 5th draft is done. I had another writing deadline today but I DID write…Okay, so tomorrow, I’ll be catching up. And I’ll be catching up on some reading, too. Need to add a couple books to the TBR pile! Hi Paula, I know it’s late but, I just finished my 5th draft for National Picture Book Writing Month! Why aren’t we writing 31 drafts this month? Very interesting guest perspectives, thank you Paula! I wrote a draft yesterday (May 5) and a paragraph earlier in the week. Hope to knock out a draft (maybe two???) today! Thanks for the motivation Paula! I wrote my 4th draft today. Not keeping up but that’s ok, I’m thinking of a lot of new ideas. They’re just not in my computer yet. I love this challenge.Thanks for you tech tips Paula. I am definitely going to try omniwriter. Thank you Greg, Erin and Ken for your insights on diversity. Great post. I love Erin’s comment that a good story is story is another way of traveling. It was great to read about the different perspectives on diversity and writing. Thanks again! Thanks for sharing these views on diversity and for introducing these authors and their work.